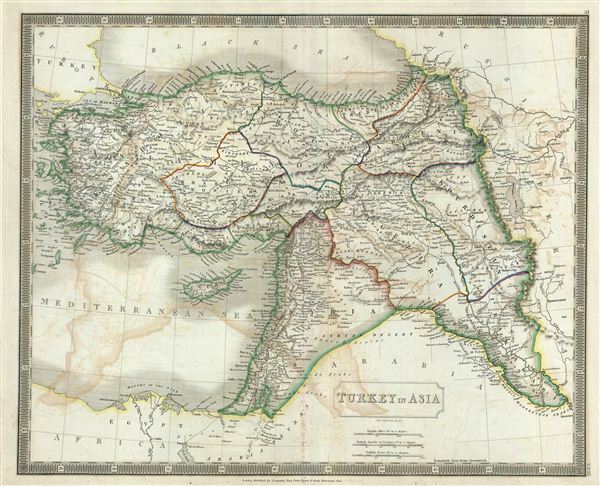 This is a beautiful map of Turkey in Asia or Asia Minor from Sidney Hall's extremely scarce 1835 New General Atlas. Centered on the Holy land (Palestine / Israel), Hall's map depicts the modern day countries of Turkey, Cyprus, Iraq, Israel, Palestine, Jordan, Lebanon, and Syria. Towns, rivers, mountains and various other important topographical details are noted. Elevation throughout is rendered by hachure and political and territorial boundaries are outlined in color. Hall prepared this map in the waning days of the Ottoman Empire, whose influence, though rapidly declining, still dominated much of the Middle East. Numerous important sites are named, including Mt. Ararat, the historic ruined Armenian capital of Ani, the ruined ancient Roman city of Palmyra, etc. Several indigenous tribes such as the Anase Bedouins, Serde Arabs, and Sark Arabs, among others, are identified. Rumsey 4224.032 (1830 edition). Philips (Atlases) 758. Ristow, W., American Maps and Mapmakers: Commercial Cartography in the Nineteenth Century, p. 303-09.